We want to send a big “Thank you” to our generous guests and team members, who together have helped us raise $24,216 to support the American Red Cross’s disaster relief efforts in Haiti following the devastating earthquake that struck on January 12. Additionally, we will be donating over $77,000 worth of new, unused clothing through Brother’s Brother Foundation. We hope that these contributions will make a difference and provide hope for Haitian citizens as they put their lives back together after this tragedy. FREE Soup & Salad Bar Coupon! What's better than the new delicious seafood specials at Eat'n Park? How about enjoying the salad bar with your meal - for free! Replace one of your sides with our endless Soup & Salad Bar at no charge during your next meal using the coupon below. Just click here to print it. Enjoy! Attention college students: Do YOU have what it takes to be a Team Smiley intern? Smiley’s Cookie Cruiser is gearing up to hit the road this summer! We’re looking for a few good guys and gals to join our team - Team Smiley. This group of goodwill ambassadors will hit the road in Smiley’s Cookie Cruiser to represent Eat’n Park at community events through Ohio, Pennsylvania and West Virginia this summer. Here’s how the cookie crumbles: if you’ve got a magnetic, entertaining personality; a passion for Eat’n Park; a professional image; and enjoy working with kids, this may be the internship for you! It’s a great opportunity for college students who are interested in pursuing a career in marketing, communications or public relations. Our Team Smiley interns gain real-world, hands-on experience in a unique and fun way. This is an internship experience like none other. After all, our interns are paid to spread smiles and, of course, Smiley Cookies! Want to learn more? Just click here to view the job description, or click here to read a blog posting from last summer’s team. Spring is nearing, which means that spring and summer sports leagues are already forming for the 2010 season. Here at Eat’n Park, we’re excited to be offering our Youth Sports Sponsorship Program for the third year. Last year, we sponsored 86 local youth sports teams, and we hope to support even more in 2010! Each Eat’n Park Restaurant location has a budget set aside to provide a uniform sponsorship for one or more teams. If you are a parent or coach of a youth sports team and are able to put the Eat’n Park name and/or logo on your team’s t-shirts, please contact the manager at your local Eat’n Park Restaurant and ask about participating in the Youth Sports Sponsorship Program. It’s easy to get started, so don’t delay! Each restaurant has a limited budget to work with, so sponsorships are awarded on a first come, first served basis. Click here to find the telephone number for the Eat’n Park Restaurant nearest to you. At Eat’n Park, not only do we strive to be a great neighborhood restaurant but a great neighbor as well! You can click here to read about our commitment to serving the communities where we do business. Best wishes for a successful 2010 season! 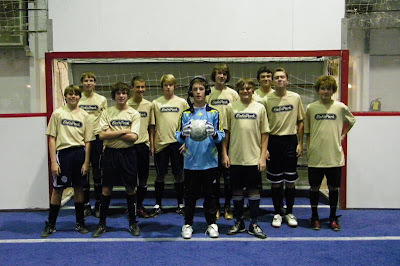 "Wild Dogs" Soccer Team, sponsored by our Cranberry Twp. Eat'n Park. Seafood Specials – Reel them in! It’s February already, which means that our Seafood Specials are here! Though it’s on the menu year-round, my favorite seafood item this time of year is our Whale of a Cod fish sandwich. If you’ve had it before, you’ll probably agree with me that it’s the best fish sandwich around. But have you ever wondered why it is so good? Let me clue you in. First off, we only use North Atlantic cod. Next, we hand-bread every single piece of our breaded fish fresh daily. At Eat’n Park, you won’t find anything chopped, formed, or mechanically breaded and frozen six months ago. Your fish sandwich or dinner is hand-breaded fresh every day and cooked to order. Finally, we serve our Whale of a Cod fish sandwich on a fantastic hoagie bun that is baked fresh each and every day by our bakers. With the care, time, and commitment we put into serving you fresh, top quality products, you simply can’t find a better fish sandwich anywhere else. So be sure to stop in soon to try our Whale of a Cod sandwich or one of our other Seafood Specials, like our new Tuna Salad Wrap, Whitefish with Mac and Cheese, or our Seafood Pasta Bake. And, if you’re interested in learning more about the history of cod, check out the book “Cod” by Mark Kurlansky. You might be surprised to learn that wars have been fought over this fish, revolutions have been spurred by it, and economies have depended on it. It’s a great read…especially while you’re enjoying a cup of our clam chowder! Are you ready for some football???? Planning your game-day menu is easy - just pick up great takeout at Eat'n Park, and save 20% with the coupon below. Score! Just click here to print your coupon. Our Potato Soup (oh yeah, Sunday is Potato Soup day!) and our hearty chili both make simple, delicious choices that you and your party guests will love. They're each available to-go by the quart for only $5.99. And don't forget that we just kicked off our Seafood Specials, including some of the best fish sandwiches in town. Click here to see them all. Need the phone number and takeout menu for your local Eat'n Park? Just click here. Free Valentine Smiley Cookie Coupon! Valentine's Day is right around the corner, and at Eat'n Park, we're sharing the love! Click here to print out a coupon good for one FREE Valentine Smiley Cookie with your next meal, now through February 14, 2010. It’s BACK! You spoke, and we listened. Several years ago, we took this fan favorite off the menu …what were we thinking?? Since then, more than a few of you have asked (and in some cases, DEMANDED) that we bring this indulgent confection back. Well, you’ve gotten your wish, and the next time you visit Eat’n Park, you’ll find the Cookie Fudge Fantasy staring you down from the front page of our dessert menu. Resistance is futile! With layers of crumbled chocolate chip cookies, hot fudge, and vanilla ice cream, this dessert is just about as good as it gets. And don’t worry; we haven’t forgotten to top the whole thing off with whipped cream, a cherry, and of course, a chewy chocolate chip cookie.